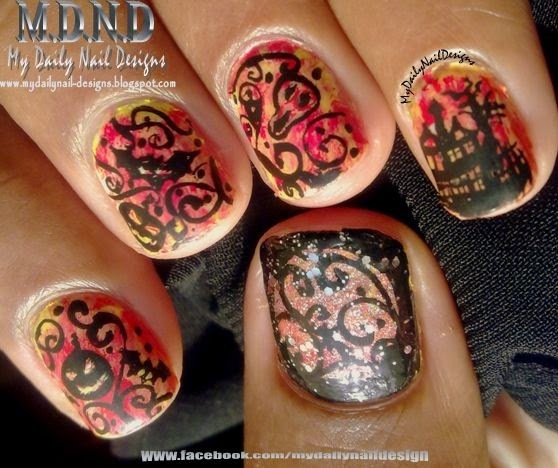 So this is the first design on short nails for HALLOWEEN !! This is a little detail work on tiny canvas but I really like it. Surprisingly it just happened I wasn't planning to do so much details but thanks to my 000brush :) and acrylic colors. This design has various levels and you can leave this on any step. I started with yellow base. I used Rimmel London sunshine as base and created background using sponge and red paint. On this background I tried to create a scene for Halloween. On thumb I created a moon using a glitter top coat and then painted some filigree to give some mysterious look. After that just painted small bats, jack-o-lanterns, boo and haunted house using a very fine brush and black paint. On empty areas added some dots.